According to sources from Engadget, Samsung's headset will have users plug their phone directly into the headset, allowing their phone's camera to provide a video feed to the outside world. 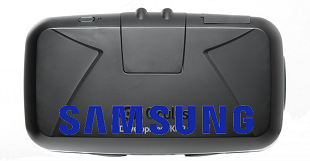 Last week, a rumor emerged that phone developer Samsung was working on its own virtual reality headset. Just earlier today, Engadget reported that the device is indeed being developed, and that Samsung is working alongside none other than Oculus on the final product. Engadget reported that they spoke with sources close to both companies who are currently using the headset on Samsung Galaxy S4 phones. The sources said the headset, while still a work in progress, is "a shockingly good experience." Samsung's headset will apparently have users plug their phone directly into the device to use as a screen. The phone will plug in through a port such as a micro-USB. The headset is said to have, at the very least, an accelerometer, so any motion-tracking will be off-loaded from the phone. While strapping a phone directly to your face may sound a bit silly, Engadget's sources state that that there is at least one practical purpose as the phone's rear-facing camera will allow the headset to provide a video feed to the outside world. The deal between the two companies is apparently built around a technology swap. Oculus is creating the software for the device, while Samsung is handling the hardware. Under an agreement between the two companies, Oculus will get early access to Samsung's next-gen OLED screens, which the company needs for the final version of its VR headset, while Samsung gets early access to Oculus' mobile software developer kit and helps develop user interface software. The advantage to Samsung, according to Engadget, is that it gets to be first to the market with a VR headset without having to invest the same time and money that competitors like Oculus and Sony are. While the machine is capable of playing games, Samsung apparently is looking to market their headset as a more general market media device, which sets it apart from the gaming-centered Oculus. Facebook and Oculus declined to comment for Engadget's story. What are your thoughts on Samsung's alleged headset plans? Sound off in the comments below. So they've developed the Darwinian awarding machine? They might just deserve the Nobel prize. Wow! Pretty ingenious, actually. Using the phone's camera to project actual reality into the virtual reality headset. I wonder how much the experience differs from just not wearing a VR headset. I'm happy that you got an advance copy of the final headset for review, but if you aren't interested, could you please send it my way so that I too can make an informed decision about a product that isn't even out yet? Probably in that not wearing a VR headset only allows for reality, where having a VR headset with an external facing camera allows for both virtual reality and augmented reality. It's a minor difference. I prefer to augment my reality the old-fashioned way: chemically. Yeah but with this you can see the world in high definition! There was me thinking Oculus would get some now much needed healthy competition. Honestly? Oculus Rift will likely get plenty of competition if it succeeds. That's one of the reasons that I'm happy that Facebook got a hold of it. Not only can Facebook afford to produce the devices at a higher volume that Oculus Rift could have on its own, they can also afford to market it by more than just word of mouth. I still have hope that the Rift will suit my needs, but even if it doesn't, if its release creates a viable consumer VR market, I still win. Your sarcastapoint falls flat on its face because consumer responsibility takes place LONG before many products are actually released. (See Diablo 3 and SimCity 5 that should have never sold a single copy due to the announced "features" ). The product doesnt need to be released to know that it has been bought out by facebook and it is WELL documented all the grievous way facebook views and treats its users. Its regrettable that a potentially great technology was bought out by an organization who does not merit support. Given facebook has shown absolutely nothing but contempt for its users, do you really forsee the finalized version of this NOT reflecting that exact same corporate philosophy? Should the world have said "hold on, lets see if it works before we do anything" before taking action had Hitler promised a cure for cancer? Or would you pretty much understand that none of the "undesirables" would have been allowed anywhere near that cure if it ever did arrive? Yeah, its somewhat like that. Should the world have said "hold on, lets see if it works before we do anything" before taking action had Hitler promised a cure for cancer? Post number 9, and we've already hit Godwin's Law. Congratulations. Sorry, but until we've seen an actual consumer product that screams Facebook and that is "violating customer privacy", EVERYTHING is pure speculation at this point. And still, worst case scenario, the until-now produced developer kits are in no way affiliated with Facebook. It's a HARDWARE peripheral with an open community, not a piece of software specifically delivered by Facebook. So you're only wishing to use the products of companies that don't engage in anti-consumer practices? Good luck with that. Meanwhile, I'll buy products that provide good value to me. Godwin aside, your examples really fall flat on their face when compared with the Rift. I didn't buy either Diablo III or Simcity precisely for the reasons you gave. I haven't sworn off Blizzard or EA games in general, but those two games announced themselves as bad news long before they came out. The same cannot be said for Oculus Rift. Everything, both from the developers and from consumers that have tried the dev kits, has pointed it out as exactly the sort of device I'm looking for, and this news about a screen deal with Samsung just confirms that(if true). If the final product ends up a wash because of Facebook's interference, then I will not buy it, but that decision will be made based on solid data, not fears of the big, bad megacorp. And if Hitler had produced a cure for cancer, people would use it. They'd still try to kill him, but they'd take the cure. That was uh... quite the analogy there... You managed to compare Facebook to Hitler and somehow work in cancer...just wow. Also thanks for speaking on behalf of all consumers Diablo 3 can't seem good to anyone because you think it's bad right? That's the way the world should work.That being said, I don't like Facebook. I don't have a Facebook account because it doesn't appeal to me. Never really saw the point in the service. But Facebook buying OculusVR? More than likely it will just result in Oculus having a lot more money to work with and this deal with Samsung could prove great for both companies. People who already made their mind up about a product that hasn't been finished yet might miss out on something good. People who make their minds up after it's finished and base that decision on facts are generally the smarter people. I understand the benefits for Oculus of having a company that mass-produces low-latency OLED screens on board. I'm not sure association with another company of somewhat questionable scruples is exactly what the project's public image needed right now.